Organic produce is often more expensive than conventionally grown food, but a recent study shows the health and safety benefits of it may well be worth the price difference. When I can, I often buy organic food, so it was great to see that a recent 2014 British Journal of Nutrition study confirmed that organic foods, including fruits, vegetables, and grains, do have a higher antioxidant content and fewer pesticides, not to mention other health-promoting benefits. 1. Organic food is higher in antioxidants. A whopping 19 to 69% higher in fact! If you care to know the nitty gritty details, the study team analyzed a variety of antioxidants, such as phenolic acids, flavanones, stilbenes, flavones, flavonols and anthocyanins, and determined a percentage for each of them, so the nutritional comparisons between organic and non-organic foods was pretty thorough. You’re probably wondering how organic foods are higher in antioxidants, right? Well, when plants are grown without synthetic pesticides like those used on conventional crops, they are able to produce more phenols and polyphenols to protect themselves from disease and insects. In humans, these very same compounds act as powerful antioxidants, substances that help protect your body from the effects of free radicals. Free radicals cause havoc on your body and may lead to diseases, such as cancer, cardiovasuclar disease, and neurodegenerative disorders. So, eating produce and grains higher in antioxidants is definitely better for your health. Plus, the researchers concluded that just by switching to organic foods, you will get 20 to 40 percent more antioxidants in your diet! 2. Organic foods are lower in starches and sugars. Unlike conventionally grown food, which is grown in synthetic nitrogen-rich soil that promotes a higher sugar and starch content, organic food is lower in starches and sugars. To me, this is especially important when it comes to eating food already high in natural starches and sugars, such as tomatoes, potatoes, sweet potatoes, corn, beans, carrots, and even edamame. Also, it’s great news if you’re watching your waistline or concerned about sugar content. 3. Organic food contains fewer pesticides. Because organic crops cannot be grown with synthetic pesticides full of toxins and other unsafe chemicals, they were found to contain much lower levels of pesticide residues — 10 to 100 times less — than conventionally grown crops. That’s substantial considering the fact that depending on the kind of pesticide used, they can have a wide range of negative health effects. The U.S. EPA notes that pesticides may be carcinogens, irritants to the eyes or skin, or endocrine (hormonal) and nervous system disruptors. 4. Organic crops contain less cadmium. Organic crops contain roughly half the amount of cadmium when compared to conventional crops, which may be due to the kind of fertilizer used on non-organic crops according to the researchers. Considering cadmium is a toxic heavy metal contaminant and probable human carcinogen that has detrimental effects on the kidney, liver, lung, bone, immune system, blood, and nervous system according to this article by the U.S. Environmental Protection Agency, that is definitely a good enough reason to avoid it the best you can by buying organic when possible. 5. Some vitamins and minerals in organic food differ from those found in conventional foods. When comparing organic to non-organic food, the researchers found there were notable differences for some vitamins and minerals, but not for the majority of them. For example, low levels of the minerals chromium (Cr) and strontium (Sr) and high levels of molybdenum (Mo) and rubidium (Rb) were found in organic foods. With regard to vitamins, higher levels of Vitamin C (L-ascorbic acid) and lower levels of Vitamin E were present in organic crops. So, there definitely appear to be some differences in vitamin and mineral content between organic and non-organic crops. For more information, the researchers suggest reading the on-line supplemental material to the study. The conclusions from this study are a little different than previous ones that have reviewed the scientific literature, such as a 2012 Stanford University study which concluded that organic foods aren’t more nutritious. (For more details on this study, please see my post, “Organic Food Aren’t More Nutritious. What? !“) However, those studies have had their limitations, such as looking at a small sampling of studies and/or only analyzing only a few nutritional components, which the researchers of the current British study point out. Considering the British study was much more comprehensive and large-scale, the results carry much more weight in my opinion. So, I don’t know about you, but for me, this study really reconfirmed my belief that organic is the way to go! Of course, I realize organic foods are more expensive and not always as readily available as conventional foods, which is why I sometimes buy non-organic. So, it’s a balancing act. I grow some of my own fruits and veggies organically, buy some organic ones, and in some cases, buy non-organic if price is a major factor. How about you? Do you think organic foods are worth it? Have the findings of this recent study changed your opinion of organic foods? Self Nutrition Data. Foods Highest in Starch. http://nutritiondata.self.com/foods-011007000000000000000-1.html? Going organic is indeed, the right thing to do. This does not just make us healthy but saves the environment too. Thanks for all the information about organic food….I really love your article as it is a quite informative!!! Organic food has become very popular. But navigating the maze of organic food labels, benefits, and claims can be confusing.It is understandable that Pesticides are chemicals such as fungicides, herbicides, and insecticides. These chemicals are widely used in conventional agriculture and residues remain on the food we eat. Thanks again for this lovely article!!!! I love organic food! I’ve actually become healthier since I started eating organic food everyday. This is an awesome post! I really loved your post as it is quite informative. I completely agree that eating organic food is healthier and better option. Organic food production has been around for thousands of years and is the sustainable choice for the future.Most organic food simply tastes better than the pesticide-grown counterparts. Thanks for sharing this article. I am sure it is going to help lot of people to change their eating lifestyle. Hursh recently posted…Superfood smoothie – simple to make & seriously healthy! Study showed great report indeed. Organic foods are far better then the conventional foods. I’ve known some farmers who shared that they grow organic foods for their eating purpose. And rest foods they grow to sale, uses heavy chemicals. And it’ very damaging for people health! Great to hear that the extra money spent on organic produce is not just going to waste. The value does appear to be there and people probably should be consuming more organic fruits and vegetables. Thanks for the article. Organic food including fresh vegetables and fruits are of course healthier and benefic for health, yet now people prefer fast food and prepared plates than cooking at homes which leads to increase the average of overweight. Good read! I agree that we can get more vitamins from the organic foods than canned goods and etc. And it is much cheaper than meats or canned goods. Thank you for sharing! Very informative article! I agree that some vitamins and minerals in organic food differ from those found in conventional foods. I agree. Definitely not a surprise, but I guess a study is important to prove the benefits of organic food for those who are unsure. You are providing great reasons for eating organic food! I read somewhere that the oranges grown inorganically have a very low Vitamin C content which goes hand in hand with what you are saying. We also need the white fibre of the oranges, the bioflavonoids to be able to absorb any Vit C it may contain, which is completely absent from orange juice. Wouldn’t it be nice if the prices for organic food came down so more people will choose to buy it. Thank you for sharing your well researched information! Thanks Yorinda. And yes, I agree wholeheartedly that it would be great if the organic food prices did come down a little! Depending on where I shop, I’ve noticed they can vary quite a bit. So I tend to spread my shopping for organic foods around a little. I buy some from the wholesale stores (e.g., Costco) and also from my local farmer’s market and grocery stores. Our local supermarket here in Edinburgh stocks organic vegetables. We also have a community greengrocers nearby. This is great but it has taken a huge effort to bring about a shift in public opinion. And of course, good food is generally more expensive than junk. Nutrition continues to be the Cinderella of the health world. It has been known in the UK at least since WW II that a balanced diet is vitally important. Nutrition in early years can predict life expectancy, diseases, and likely cause of death. Yet the UK and the US have supermarkets stocked with food that is ruinous to health. Thanks for sharing your thoughts on organic foods. Our supermarkets here have both “good” and “bad” foods as well, so doing healthy shopping all goes back to shopping the perimeter of the store – where the produce, meats, fish etc. are stocked. Also, here in Southern California, we’re lucky enough to have several markets around that focus on organic or healthy foods. However, even in those stores, I still find junk food disguised as healthy food. It seems the manufacturers always try to fill all the voids! Hello Irene. Thanks for your comment regarding your thoughts on organic farming. Which video are you referring to? Hey this is really great info, I enjoy that you think critically about the scientific method of the papers. 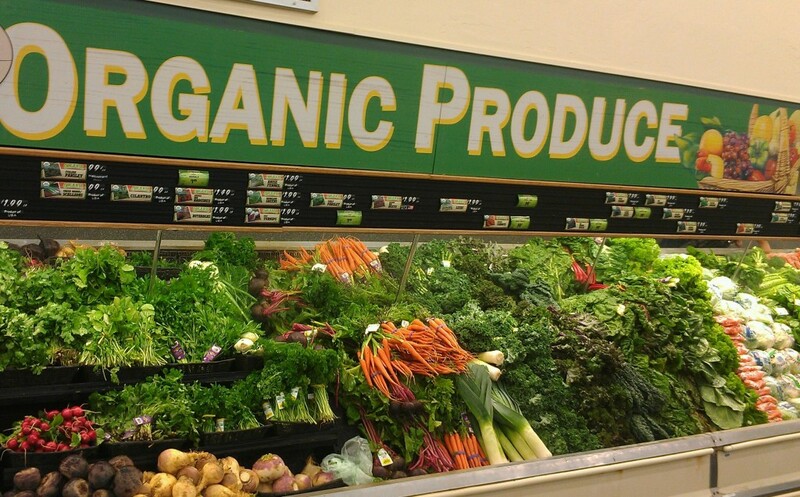 I always suspected organic food was healthier, the price is also an issue for me as well. If I get any space in my back yard I plan on planting a garden. It won’t be much but every little bit helps. Hi Justin. Thanks for the positive comment. Whenever I come across relevant scientific studies related to holistic health and green living I always try to share them with readers. Some of us need to know the science behind something to give it a try! Having your own garden is so fun (and sometimes not so fun if it’s big and you have a lot of weeding to do)! If you don’t have any space, give container gardening a try. Maybe start with some herbs? Thanks for all the information Karen, it’s understandable that organic food would be much better for us. It would be great if all those pesticides weren’t necessary, so that all food would be equal. I used to grow veggies and much of it got eaten by the pests before I got a chance to pick it. Fascinating and it actually makes a lot of sense Karen. It’s just too bad organic food is so expensive. Everything is expensive where I live in the Islands but anything with an “organic” label stamped on it borders on the obscene. About as close as I can come is to buy from local farmers at our weekly farmers market. It’s maybe not quite as healthy as organic but it’s much better than the artificially ripened produce in the grocery stores. Thanks so much for sharing this important information! Hi Marquita. Yeah, it’s a drag organic food is so much more expensive! When it’s not an option, I like your idea of buying from your local farmer’s market. That way at least you can ask the seller how the food was grown and where it is from — something you can’t necessarily do when shopping at a grocery store.